When to Hike: Year-round, except when there is too much snow cover. Directions to Trailhead: From the Central Mt. Shasta City exit from I-5, take Lake Street east to Mt. Shasta Blvd (second traffic light) and turn left. Take North Mt. Shasta Blvd north to Nixon Road, where you’ll turn left and cross the railroad track. You will then take an immediate right turn into the entrance of the City park. Drive through the park, past the lower lodge buildings to the parking for the play fields and picnic area. Walk west to a bridge over Spring Creek which links to the main trail. Special Features: Big Springs — the headwaters of the Sacramento River; Spring Creek; Kingston Meadow; and Kingston Ditch. Description and Comments: The Mt. Shasta Greenway is an idea that has been discussed for nearly 20 years. The concept is for a paved multi-use trail that would connect the City Park to downtown Mt. Shasta, continue southward to connect with the Lake Siskiyou Trail and northward across north Mt. Shasta Boulevard to connect with the Spring Hill Trail. Presently, we have a trail network that connects the City Park to Kingston Meadow, plus the Nepenthe Trail adjacent to the Mercy Hospital. 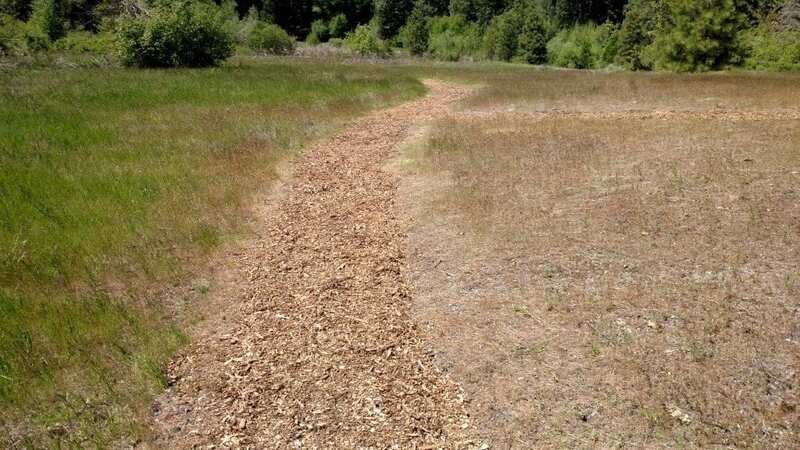 The current trail configuration provides a wonderful collection of loops that encourages exploration of the City Park lands south to Kingston Meadow (owned by Siskiyou Land Trust), and Big Springs itself north and west of the grassy park proper.